It is unlikely that many of us would reading about the Group A match between Baroda v Madhya Pradesh at Dharamsala, starting today !! At Mohali, While England were battling hard to survive a harrowing time against the Indian spinners on a wearing pitch, Joe Root indulged himself in some clever gamesmanship and managed to get under Ravichandran Ashwin‘s skin.Usually, batsmen prefer to stay beyond the wide marker at the non-striker’s end in order to steer clear from running on the wicket as well as procure more space to get to the other end without much difficulty. 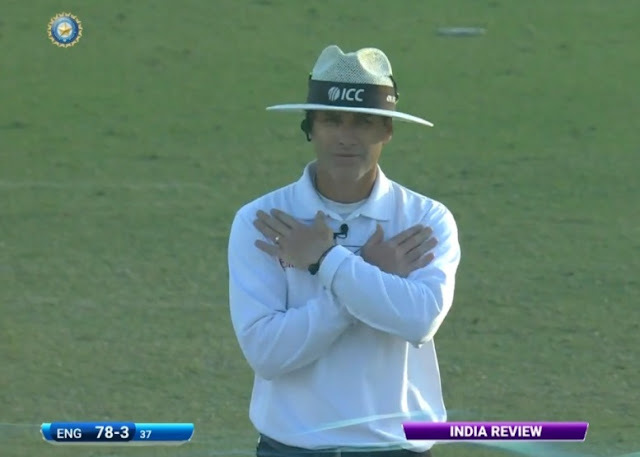 However, Root stood extremely close to the umpire thus narrowing the gap between them and the bowler.The thought-process behind the Yorkshireman's unique position was to give himself a better chance to assist the striker's DRS plea. With the ball beginning to grip and turn, the batsmen also had their hands full when it came to judging umpiring decisions. Ashwin (bowling around the wicket to Cook) was not one bit pleased with Root’s ingenuity and proceeded to complain to umpire Chris Gaffaney. But, the off-spinner did not get his way as the playing rules allowed a non-striker to hold guard within the prescribed perimeter. However Ashwin had the laugh, winning DRS against Ben Stokes, reviewed and then given out by Chris Gaffaney. Lot happening in Ranji. Kerala coach P Balachandran has been sacked midway through the 2016-17 Ranji Trophy season after the state association felt the team's performances had fallen short of expectations. Former India seamer and Kerala bowling coach Tinu Yohannan has been given the team's charge, and M Rajagopal, the coach of the state's Under-23 side, has been named assistant coach. There has also been a major overhaul in the team, with four players - senior batsman Robert Fernandez, wicket-keeper Nikhilesh Surendran, seamers U Manukrishnan and MD Nidheesh - being axed from the squad. Instead, five players from the Under-23 team - Fabid Farooq, Mohammed Azharuddeen, Salman Nizar, Akshay Chandran and KC Akshay - have been picked for Kerala's remaining matches against Goa, Andhra, Tripura and Services. Kerala are one of two teams in Group C that have not yet registered a win after five rounds of the tournament, despite securing a first-innings lead in four of their five games. On a different pitch, Mumbai Cricket Association and Tamil Nadu Cricket Association have opposed BCCI's decision to reschedule two postponed Delhi fixtures (due to pollution and smog) to after the completion of the ninth and final round of matches in the ongoing Ranji Trophy season. The Group A clash between Gujarat and Bengal and the Group C fixture between Hyderabad and Tripura will now be played four days after the completion of the final round, from December 15 to 18, in Visakhapatnam and Kolkata respectively. The MCA has already lodged an official protest; TNCA is expected to follow suit. The knockout matches of the Ranji Trophy have been rescheduled to accommodate the two league fixtures in Delhi which were postponed due to pollution and smog. The quarter-finals, initially scheduled to begin on December 17, will now be held from December 24 to 28. The semi-finals were moved from December 27 to January 3, while the final, originally set to be played from January 7, will now take place from January 12 to 16. The BCCI also announced that the Irani Cup, to be played between the Ranji winners and Rest of India, will be held from January 22 to 26.